Using 4.0-9426, the connect button does absolutely nothing. We have followed the guide correctly. Using both traversal server, and direct connection, absolutely nothing happens when we click the "Connect" button. However, if the button is clicked very fast over, and over, an error window saying "A NetPlay window is already open!" will come up. Are you both hosting, or are one of you hosting and the other joining with a code? Can you see each other in the netplay window? Are there any warning messages in the netplay window? Do you have the same MD5 sum for the game? (06-09-2016, 04:24 AM)KHg8m3r Wrote: Are you both hosting, or are one of you hosting and the other joining with a code? 1.) One of us is hosting, the other joining with a code. We've both tried. It feels like the button is a dud. 3.) Besides the one I mentioned, no. 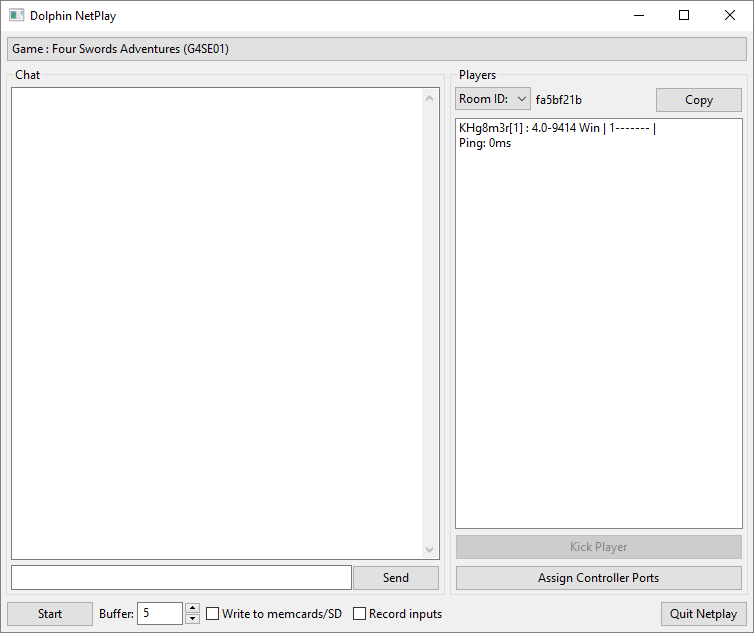 The netplay screen is divided into two main windows once you have a game hosted. If you can't see that both of you are connected in the left screen with a ping under your names, then you aren't actually connected. (06-09-2016, 09:48 AM)KHg8m3r Wrote: The netplay screen is divided into two main windows once you have a game hosted. If you can't see that both of you are connected in the left screen with a ping under your names, then you aren't actually connected. I can see two screens when I host a game. However, I do not see both of us connected. Just me. We've both tried hosting, and it doesn't work. So far, we've only tried Mario Party 7. Also, I'm now on Windows 10 but that hasn't made a difference. After you host the game, this is what you should see. Then give your friend the room code, and they should appear in the list on the right under your name. (06-10-2016, 02:27 AM)KHg8m3r Wrote: After you host the game, this is what you should see. Then give your friend the room code, and they should appear in the list on the right under your name. I think we're doing it correctly. This is me doing it with two instances of Dolphin 4.0-9426 open on one W10 laptop. I guess it may be a bit unorthadox to do it on one PC but this is exactly what happens on two PCs anyway. The second time is me fast-clicking the Connect button. The port break is failing. You'll have to manually port forward. Edit: Actually, I had this problem before. Windows 10 Firewall was blocking me. (06-10-2016, 05:08 AM)JMC47 Wrote: The port break is failing. You'll have to manually port forward. (06-10-2016, 05:22 AM)Whateverguy360 Wrote: Thanks. This is resolved. A bit late, but may I ask for what you did in specific? I have port forwarded both 2626 and 6262 and I'm still having the same error as you were beforehand.